Listen, it's good to be well-connected: e.g., I've got Martian buddies. They're my "go-to" people when life on Earth turns.... banal? They didn't pop over to catch The Martian and share popcorn with me, but we were together in spirit. 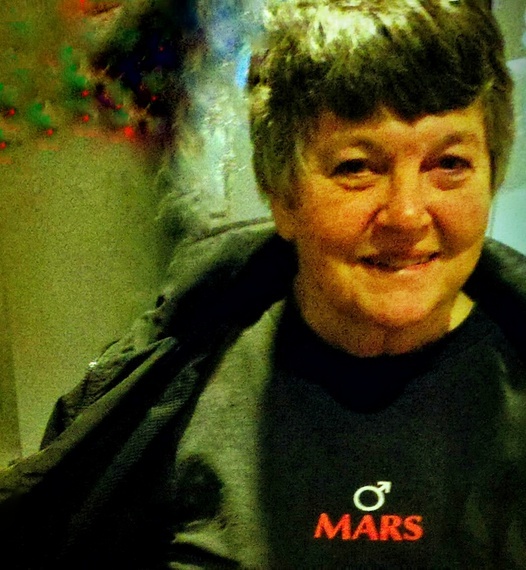 Among my favorite Martians is Donna Shirley, who, btw, has an asteroid named after her. Ms. Shirley headed NASA Mars Exploration that put the first rover on the red planet on July 4, 1997. You might remember Donna from CNN broadcasts educating the world on Pathfinder's enchanting journey. She was the 'Mom' of its far-ranging rover that left earthlings agog as it bumped over the rocky surface. Pathfinder figured bigtime in The Martian, buried under a heap of red soil. Matt Damon had to dig it out (spoiler alert) to save himself. Donna explained that the winds aren't ferocious enough on Mars to blow over his emergency escape rocket - "the atmosphere is too thin" - but in spite of such technical anomalies, she enjoyed the movie. I was one lucky space cadet in 2012, getting to witness a new rover, the Curiosity, land on the planet. It was over-the-top thrilling because I happened to be with Donna watching the 'live' (~20 minute signal delay) broadcast straight from Mars. Everyone in the room was weeping when it touched down - a miraculous feat, avoiding a zillion things that may have gone wrong 48 million miles away. But Donna had no doubt it could be done because, fifteen years before, she and her team had done it! She'd been NASA's first female space program manager. She later became the founding director of the Science Fiction Museum in Seattle. Donna Shirley is a stand-up supporter of science education. When I asked her to help my community raise money for a new STEM school, she came flying into town (via airline - not her own plane) and volunteered a tutorial on Mars exploration. It was a hit, and that was before Mars was super popular. Mars is the bomb right now. Kids talk about going to Mars when they grow up and they aren't kidding. They know more, care more, about Mars than their parents and grandparents who may still think of space exploration in sci-fi terms instead of a reality show. Due to the sum of spacecraft, landers, robots and orbiters, we now have spectacular information about planets in our solar system, especially Earth. Before its extraordinary landing, Curiosity had to speed to Mars for nine months, starting with its launch in November, 2011, which I attended. I'd been fascinated with the reddish star in the sky ever since reading The Martian Chronicles and always craved to experience a Cape Canaveral rocket launch. When I learned there was to be a rocket to Mars carrying a rover car the size of a Mini Cooper... well, I was compelled to be part of the epic event. I hung out at Cocoa Beach, Florida, along with thousands of others on Thanksgiving Day, hoping the blastoff would occur on time the next morning. 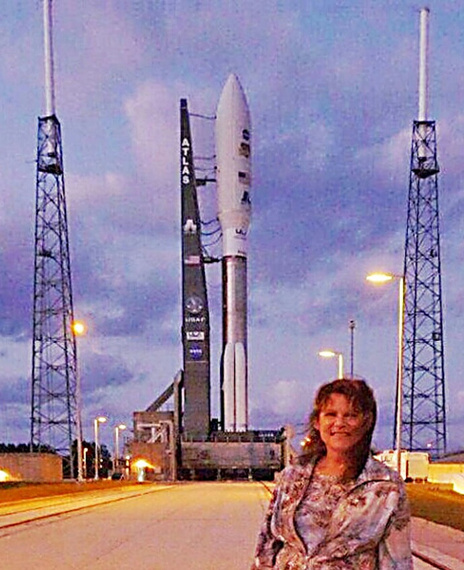 The night before countdown, a friend gave me a surprise tour of the launch pad - I glowed like a lottery winner - where I stood within feet of Curiosity, all packaged into the spacecraft payload bay. I gazed up, to the pointy top of her towering, steaming, five-engine rocket booster. And, yes, Curiosity was declared a female, just like Donna's robot had been (only hers was the size of a microwave oven). While I was reveling in my temporary VIP status, a woman named Jillian Arnold was nearby checking the cameras she'd set up earlier. They were high-res, high-speed, 3-D IMAX cameras to record the launch. Jillian was a NASA cinematographer whose job was to provide images of every aspect of the liftoff. We'd met by chance in the hotel, over drinks, and toasted the magic of this very special evening. "So, what are you doing here, Jil?" I expected her to be an engineer from one of the countless sub-contractors who contributed to the billion-dollar planetary mission. She said she was the lead camera specialist, filming the Atlas V/Curiosity liftoff. "What about you?" I explained I was a rocket groupie, a Mars junkie, and a poet. I was here to write a poem about Curiosity. We became fast friends over dinner. My burning question was how close she would get to the rocket at t-minus-zero. Jillian described her previous launch assignment, where she observed from the closest point possible, a house less than a mile away. This was romantic to me, because it was, I recalled, where the early astronauts stayed with their wives back in the '60s. "Was it unbelievably loud?" I could only imagine the thunder. She said she had ear protection but the vibration of the blast knocked her off balance. This time she would be prepared. Jillian has since photographed numerous spacecraft tests, including some of Orion's, the astronaut vehicle currently in development. When my personal rocket left the Earth (exactly on time) the next morning, I thought of Jillian, and of Donna who had also witnessed the launch of her flagship rover in 1996. I imagined Curiosity, her descendant, as she hurtled into the wild blue yonder. I got so tearful and jazzed I composed the poem in two hours and sent it off to the NASA administrator, Charlie Bolden. He liked it and immediately forwarded it to his staff, whereby I got my 15 minutes of fame - as Rocket Laureate! America's exploration of Mars continues in a race with other countries (well, maybe a stroll) to put a human there.. A project called Inspiration Mars advertised for a married couple to apply. (As humorist Dave Barry says: I'm not making this up). A 500-day slingshot journey around Mars would require that the couple be mature (40-ish, not newlyweds? ), calm-natured (it's one freaking long trip in a tiny room), and altruistic (um, they may not return). This project will not happen in two to five years as hoped, but the job advertisement is for real. Go ahead: apply. In the meantime, the next step is the newest rover, InSight, originally scheduled to launch this month, which will test the seismology and heat of Mars. Unfortunately, InSight was recently postponed due to an instrument failure, having to be re-approved to launch in 2018. These programs are continuous investments in space exploration - however, they must fight for funding every time. If you watch The Martian - which is as much a depiction of reality as science fiction - you get a hint what must happen to render Mars a human space base. I believe the millennials have heard enough already; they're hot to get there. After all, it's been nearly half a century since man shot a golf ball on the Moon. We'll have a worldwide bon voyage party for that astro-couple who will be the first married people to have an argument on the way to Mars.